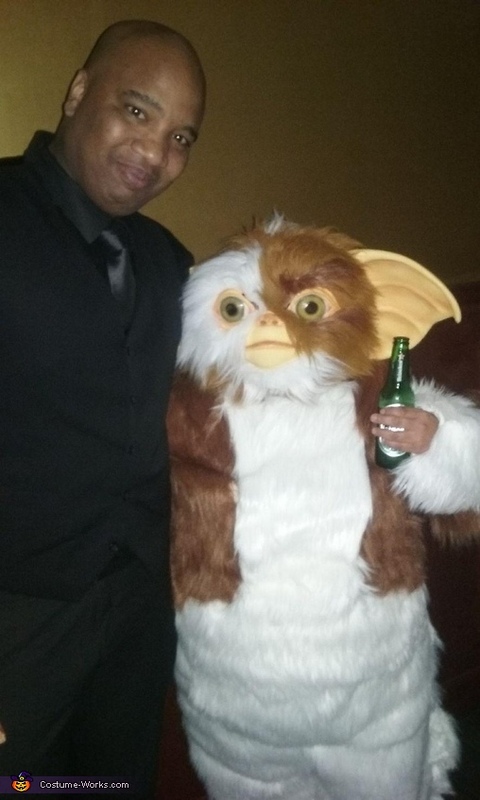 I DONNA DIAZ IS WEARING THE COSTUME, THE IDEA CAME FROM THE MOVIE GREMLINS. HOW TO: BUY A WHITE A PAIR OF SWEAT PANTS WITH MATCHING PANTS. BUY A FAUX FOR IN WHITE AND BROWN TO MATCH. MEASURE MENTS WIL BE DIFFERENT DO TO SIZES. ALOT PAITENCE AND SPRAY GLUE TO ATTACH FUR TO SWEATER AND PANTS. BUY MASK ONLINE. YOU MIGT HAVE TO ADD ADDITIONAL FUR TO THE MASK TO MAKE IT BLEND.